“When that big dragon on two legs breaks through the massive oaken table we over-turned, we’re gonna smack him with our huge swords!” Plotted the Fire Giants as the Dragonborn Fighter called “Ox” smote at said table with his Flametongue Adamantine Great Axe. …You don’t get to use multiple swings when you’ve taken a Ready action in 5e! (which was a shame as the second attack was a crit and Ox was gonna get 12d6 +14 to the face!). After that session I decided to check my own logic to make sure that I had made the right ruling, and newly convinced that I have, I decided to capture it here for posterity. Which isn’t to say that this is right for your playgroup. If you or your DM is doing something different, and its working out well, then more power to you! In this article, “action” or “Action” means the list of activities that are available in the Actions in Combat section of the Players Handbook. Multiattack refers to both the Multiattack monster ability and the Extra Attack class feature that is granted to certain martial classes as they advance in level. Note they both say “attack on your turn”. swing means one of the attack rolls made if a character with multiattack uses the Attack action. So if you have the ability to make one attack roll for being alive, and then one additional attack roll with the Extra Attack class feature, you get two “swings”. And if you thought that was nitpicky, in 5e you don’t ready an action, but you take the “Ready action” which may seem pedantic but is quite important to understanding what is actually happening. 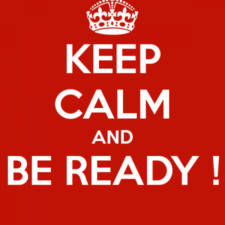 So what is actually happening when you take the Ready action? In combat each player / monsters (individually or collectively) roll initiative. They then take their “turn” on their initiative count. If you’re doing something that’s not in the initiative order than you are not acting on your turn (which is important). They also get a Reaction which is a response to a trigger and happens after that trigger has completed. In almost every case that Reaction occurs outside of their turn. The only time you can use a Ready action is on your turn, and you describe what you intend to do when a trigger occurs before the start of your next turn. For this article, it’s assumed that you’re going to want to swing at an enemy, but you could move, or prance about, or do shadow puppets or whatever. So… You chose the Ready action to hit the enemy when they smash down the over-turned table in front of you. In choosing the Ready action you are not able to choose the other actions in combat, such as the attack action. Nor are you going to be acting on your turn, as the Readying happens based upon somebody else’s turn and your Reaction happens immediately after their action completes. Same for PCs as it is for monsters, excepting some other ability that grants multiattack for swings from the Ready action. And what happens to my place in the initiative order? Well it stays exactly where it is. The concept of delaying your attacks like used to happen in previous editions of D&D doesn’t exist any more. So if you’re on an initiative of 2 you can’t take a Ready action to reset yourself back around to top initiative order by skipping a turn. Incidentally, taking the Ready action doesn’t stop you from doing other stuff in the turn; for instance, you could still use a bonus action to attack a valid target with your offhand weapon. Or a quickened spell for a Sorcerer. Or the Cunning Action rogue class feature. I hope that you found this useful, as it’s not always as obvious as you’d like it to be!